Fantasy: Harness the essence of your enemy and use it against them. Command the battlefield from within your puppet, projecting power from a vehicle of dark energy. Grant Titan a strong roaming super with low immediate kill potential but much stronger pushing power. Force players and AI to commit to focusing you down or risk being pushed out of entrenchments. The Titan wraps themselves in the Void, drawing from the essence of the last enemy they vanquished or from the environment around them. The Titan is consumed by and controls a puppet in the form of a major combatant of the race last defeated, or whatever fits the theme of a competitive map. Captain Essence: Take the form of a Fallen Captain and rush your enemies with a rapid-fire Shrapnel Launcher. Lateral dodge can be performed by pressing LT.
Minotaur Essence: Take the form of a Vex Minotaur and bombard your enemies with a long-range Torch Hammer. Rapid forward blinks, ending in a strong melee, can be performed by double tapping LT.
Wizard Essence: Take the form of a Hive Wizard and assault your enemies with Darkness Blasts. A zoning field that deals damage over time can be placed at target location by pressing LT.
Colossus Essence: Take the form of a Cabal Colossus and suppress your enemies with a rapid-fire Slug Thrower. Release homing missiles by pressing LT.
Taken would result in a form related to the origin race of the last individual combatant killed. Splicers count as Fallen for purposes of super. Aesthetic notes: Larger, semi-transparent (ethereal feeling) model used for enthralled combatant super forms; supered titan is encased inside these larger models and can be seen by foes; supered titan’s skeleton is mapped to combatant’s animation rig and mimics actions of combatant shell. Combatant shell has large health pool (base HP + shields) and requires focusing to bring down. Unlike other offensive Titan supers, rapid kills are not the goal. Instead, the player forces enemies to focus them down or run, or they will be fighting at a disadvantage due to the asymmetric nature of the health pools. Upon depletion of shell health pool, the shell evaporates but the player does not die; instead they drop from their suspended state with shields depleted. Physics properties of a standard incendiary/suppressor grenade. Upon detonation, all targets in area take minor Void damage (~70 HP) and a cage forms around the detonation area. Targets can remove detonation by shooting the cage; focused primary fire results in target freedom in less than a second. Cage cannot be entered from outside; allows forced restriction of movement paths even if targets are not caught in detonation by removing avenues of movement. Tyrant melee ability splashes on hit, dealing normal melee damage to all targets in an area. Targets in AOE also take increased damage from all sources. Black tendrils emanate from targets with this effect. Prison of the Void: Targets detained by the Tyrant take damage over time until freed. Eternal Imprisonment: The Detain cage lasts longer and has more HP. General Population: The area of effect of the Detain grenade is significantly larger. Servitude: Targets affected by the Mark take increased damage from all sources for a greater duration. Conflict of Interest: Minor minions of the Darkness affected by the Mark are enthralled by the Tyrant and fight alongside them for a short duration. Minions are killed when the Mark expires. Soul Siphon: The Tyrant gains bonus Armor and Agility for every target affectted by the Mark. The duration of your enthralled puppet increases significantly, but the puppet loses its shield. Detained targets are also affected by the Mark of Command for the duration of their imprisonment. If not destroyed by weapon fire, the Detain cage detonates with the force of the primary grenade detonation upon expiration. Your puppet’s secondary abilities recharge significantly faster. Upon destruction or expiration, the Detain cage briefly blinds its prisoners as they exit. Exotic Node – The Second Law: Each individual bolt from a shot that hits a target reduces the charge time of the next shot. This buff stacks with itself until the weapon is reloaded. Hip Fire – this weapon has increased accuracy when fired from the hip. Enhanced Battery – increases magazine size. Rangefinder – aiming this weapon increases its effective range. The goal for Heatsink is to develop the fusion rifle into the PVE DPS monster that weapon class has never quite managed to reach – despite being solid performers, nothing has really become a staple for people to use against AI. When a player can stack up charge buffs using the exotic node, this would be a go-to for bosses and major-heavy encounters, and would allow players to play a little metagame where they decide how they want to build their gun – either building stability for more reliable “full” charge buffs, or going for a safe increase in overall damage with a larger magazine. By the end of the magazine, you end up with a Pocket Infinity that has standard fusion rifle range, but the damage is spread over a greater duration. The primary and secondary perks ensure that no matter what, you’ll be able to effectively hit your targets which can be an issue with some fusion rifle frames due to the long charge time. In this case, we choose the lowest charge rate fusion rifle frame as a balancing factor for PvP gameplay, and then further lower its base stability by 10 – the charge time and low initial stability makes a player less capable of reaching an enormous charge time buff in PVP gameplay because of the inherent dangers of using a fusion rifle in those modes with the increased lethality of your opponents. Exotic Node – In Triplicate: This weapon fires three homing warheads in a tightly grouped spiral pattern, one of each element type. Each warhead does slightly less damage than a standard rocket. Soft Launch – increased velocity, more recoil. Warhead Verniers – increased velocity and blast radius, more recoil. Aggressive Launch – more predictable but increased recoil, increased blast radius, lower velocity. Clown Cartridge – reloading this weapon has a chance to grant a larger than normal magazine. Quickdraw – faster weapon swap time. Flared Magwell – faster reload time. Cluster Bomb – rockets create cluster bombs as they detonate. This weapon serves a point-and-click purpose: if it has a shield and it needs to go away, this will do the job. Potential concerns are an overall lack of shielded enemies in content – when Ironclad or Match Game are present, this feels like a solid loadout choice. However, in cases where that isn’t the case, unless missions are more prominently multi-faction, it would be a hard sell. However, with three smaller rockets you would also be getting increased damage over a normal rocket launcher overall, increasing general effectiveness and making it a more attractive choice. This is part of a larger concern over rocket launchers – in PVE content they do not deal enough damage to make them worthy of a loadout choice, especially not with their heavily restricted inventory sizes. As HMGs have become more and more lethal and have maintained (largely) their sustainability with very large ammo capacities and increasing prevalence of low fire rate/high impact frames, rockets have been edged out of the picture entirely ( ed: this was written prior to the launch of Rise of Iron; Gjallarhorn was not considered). Exotic Node – Giveth/Taketh: Scoring kills on minions of the Darkness with this weapon grants reserve ammunition for your other weapons. Scoring kills on minions of the Darkness with your other weapons grants reserve ammunition for this weapon. Steadyhand IS – Stable sight, optimized for excellent recoil control. Crowd Control – Kills with this weapon grant bonus damage for a short time. Reactive Reload – Reloading after a kill grants bonus damage for a short time. Sidearms have never really found their place against AI. Individual rounds don’t hit very hard so they sometimes fail to meet the stagger threshold, something that’s crucial in helping the player feel powerful. They chew through ammo at an extreme rate and players aren’t willing to devote an armor talent to increasing that pool – combined with their limited range, they’re a niche pick at best, and are most often ignored in favor of high DPS range-specific utility. As a whole, sidearms can’t be treated like other weapons in the special slot – they don’t offer the same things and aren’t intended to be used like that. Instead, we can offer a more attractive tertiary character-wide playstyle shift, and make a weapon that isn’t just panicked backup pick or a grimoire grind, but something you want to tactically and mindfully switch to, and something that opens up how you play the game. With ammo being such a concern for so many weapon archetypes, offering the player the ability to, in some small way, bypass the problem and just play the game might make some space for an underutilized special weapon choice. It’s a really attractive offer, and it has to be borderline broken in terms of power because you’re sacrificing so much utility by giving up one of your range-extreme options. Fundamentally, sidearm play is more aggressive and instinctual than a player with a sniper rifle perpetually equipped is used to – offering a strong choice in that archetype introduces people to what might be a new way of playing. Fantasy: A bender of time and space; extreme mobility and high skill cap; capture the feeling of guerilla tactics in context of direct combat – the illusion of force multiplication through smart application of abilities and movement. Innate ability to forcefully break entrenchments and setups by enabling rapid movement past defenses. Translocate: Signature class ability, replaces melee charge. Pressing melee button throws a translocation beacon with the physics properties of an incendiary/suppression grenade (can be skillfully bounced). Pressing melee button while melee is on cooldown (and no player in melee lunge cone) teleports player (with full inertia and directional vector) to beacon location. May be used while beacon is in flight. Player leaves trail of blue energy in direction of beacon upon successful teleport. Depth Charge: Grenade ability, primarily zoning utility against entrenched enemies. Rapidly expanding sphere (1m radius) of blue/white energy that deals (190) damage across 3 ticks, one tick per (0.25) seconds. Can kill very low armor players if no damage instances are avoided. Grants large bonus agility and moderate bonus armor and rapidly recharges melee ability. Kills while super is active immediately regenerates grenade and melee energy. Holding super buttons while super and beacon active creates expanding ring around player. Any allied player within ring at time of button release will be teleported alongside warlock. Null Field: Translocating while supered causes enemies around the beacon point to be suppressed for three seconds. Force Multiplier: Allies translocated during super gain smaller agility buff for three seconds (Pulsewave tier boost). Course Correction: Player can hold melee button for 3 seconds after translocation to return to point of origin. Spatial Friction: Large Agility bonus for 6 seconds after successful translocation. Residual Energy: Allied players near origin point of translocating player gain +2 recovery for 5 seconds. Translocations are always preceded by a burst of damaging energy around the beacon. Depth Charge is spawned at origin point of successful translocation. If no players are damaged by Depth Charge instances, Depth Charge re-detonates with a single blast of 2x original radius, dealing 120 damage. 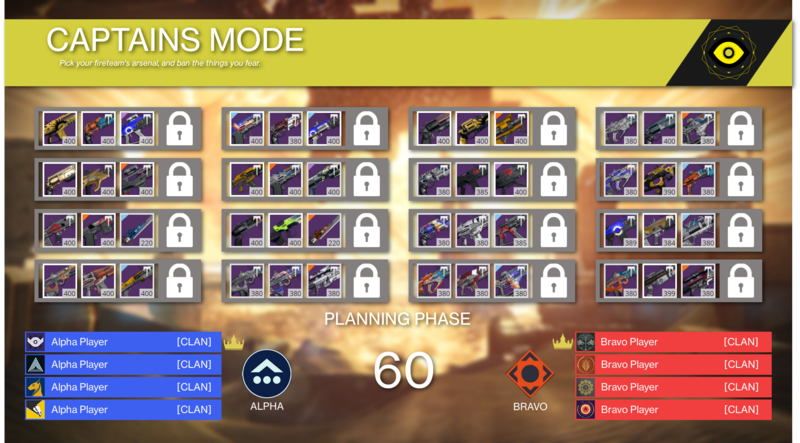 The below are structured attempts at trying to plug up some holes in Destiny’s current exotic weapon stable – in some cases attempting to make valid examples of archetypes that currently do not see much use, in some cases attempting to shift gameplay to a less-seen path, and in some cases just attempting to put forth some new ideas. Of Your Peers: After three consecutive precision hits, your next shot will be a free lucky bullet (Triple Tap + reliable LITC). Zen Moment: Landing shots with this weapon increases stability. Reactive Reload: Reloading after a kill grants a damage bonus for a short time. Item Goals: Incorporate Triple Tap in a way that feels more transparent than current lackluster player experience. Create a zen-state feeling for players landing constant consecutive hits and being meaningfully rewarded without weapon DPS rising to the point of breaking encounters. Improve current boss fight precision monotony at endgame strike difficulty by adding minigame. Aesthetic Notes: Four lights on outer side of weapon scope (facing player) with matching indicators in scoped view. Three yellow indicators light up as each corresponding precision hit is scored. Fourth light (green) indicates lucky bullet is ready. Pick Your Poison: This weapon changes its damage type to match the shield color of the last target hit. Counterbalance: This weapon has increased stability. Hip Fire: This weapon has bonus accuracy when fired from the hip. Item Goals: A shielded-major solution. Not the highest damage output in class, but a good all-round solution when facing mixed-faction encounters or Ironclad strikes. In high level content, especially Match Game weeks, fulfills a fantasy of your heavy being able to chew through anything the game throws at it and not suffer damage reduction. Stability and hipfire bonuses with this HMG archetype creates Rambo moments as you throw a wall of fire at enemies. Trades damage output for versatility. Aesthetic notes: Rounds must change color to match current weapon damage, along with indicator screen below scope. The Eye: Viewing a target in scope with this weapon marks them with a Keen Scout tag visible to your entire fireteam for 5 seconds. This weapon deals reduced damage (75% of normal impact-tier) and has no scope glint. Hidden Hand: This weapon has greater aim assist. 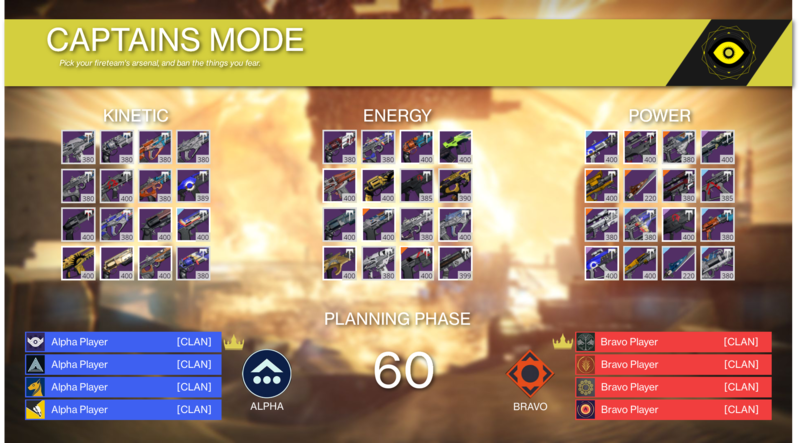 Item Goals: Move sniping in high-level Crucible activities away from people passively scoping down hallways waiting for runners and towards a more active scouting-support role. Enables a “mission control” experience as players direct their team towards their target while remaining less visible than normal to enemies. Lower impact makes it a less offensively viable weapon with greater utility, but is still capable of rapid retaliation in action due to fire rate of weapon archetype. Note: Current radar soft-detection radius makes this less viable due to map design (short average engage range when flanking) – potentially should also mask user on outer ring of radar to make it a more appealing option.